About This Painting: In this oil painting of an orange slice and cherries I want the Orange slice to be the center of interest so I gave it a little drama with a transparent look at the tip where the light was the strongest. the cherries in the background are made darker so they don't show up the star attraction " the orange slice"
About This Painting: Now this was not a daily painting as it took me about two weeks to get it done. I think I have finally stopped tweaking it. A brightly colored fall still life. I think I might try another one but add a few fall leaves and change the color harmony. 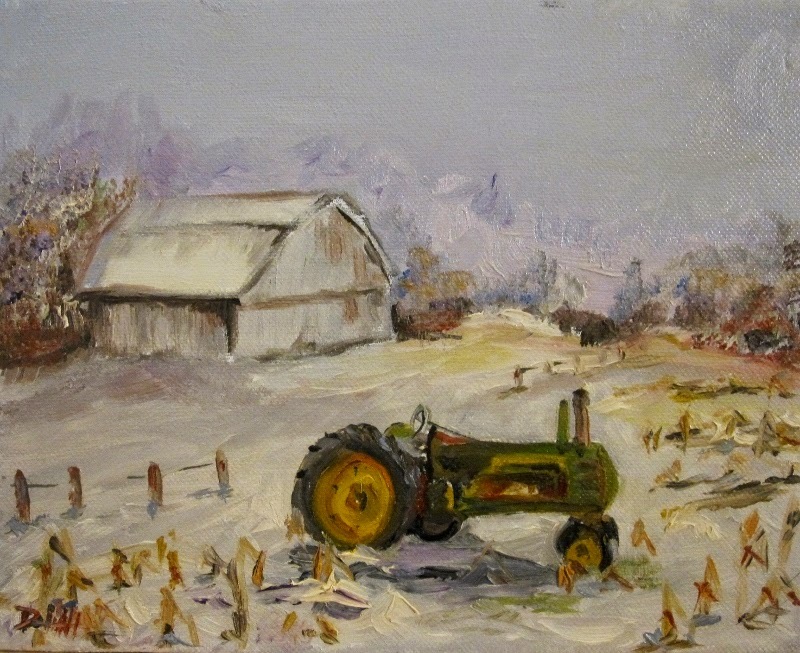 About This Painting: The farms are picking field corn now. I see corn pickers with head wider then the highway. My dad had a 4 row corn picker now that seems like an antique. Here is a quick look at what I've been doing the last month.My daily paintings and a few more. About This Painting: This is a Plein air painting done at Dexter Michigan. I painted this daily painting this summer but just got it back from a show so I am giving you a little summer sunshine today.